The new Subaru WRX STI S209 is unlike any other car the automaker has ever sold in America. Not because it’s the fastest or the most expensive, but rather, because it’s not technically a Subaru. The 341-hp STI S209, which debuted at the Detroit Auto Show in January, is Subaru’s fastest STI model yet, it will probably be the most expensive model yet, and it’s the first S-line car to make its way to our shores. In case you’re not completely dialed into obscure, special edition STI models, the first of the S-line family was the S201 in 2001. STI’s first car of its own was the Subaru Legacy RS Type RA, which came around in 1992. The thing that’s weird about the S209 though, for us Americans at least, is that it’s not actually built by Subaru. We’re used to STI being just a trim, a model. But the S209 is different. As the Japanese automaker’s North American business planner Yoshihide Yano told me, that’s because Subaru’s production quality standards can get in the way of how STI wants to build sports cars, like the S209. Unlike the normal WRX STI models that we’ve been getting in America since 2004, the S209 is first assembled by Subaru, and then shipped off to STI’s assembly facility to have the job completed. That’s a different factory, as Subaru notes in its press materials. The location is Subaru’s Kiryu-Kougo subsidiary, which is maybe better known for making fire department vehicles and other specialty cars. “There’s a certain technical standard to build a car… There are many different ways people enjoy their cars,” Yano told us in an interview. “[For example,] people will start complaining if you have a narrow space between the wheels and the body,” he said, probably referring to wide tires and more aggressive stance on performance cars. Production at Subaru’s Gunma assembly plant in 2015. The way Subaru explains the production process is that the cars—in this case, WRX STIs—start off on a normal Subaru production line, but when it’s completed, it gets shipped off and “sold” to STI. Unlike for the normal WRX STI models, which finish assembly at the main Subaru production facility. Once in the performance brand’s hands, the cars get fitted with the new performance parts—parts like its new 19x9 STI BBS wheels, its unique 265/35R19 Dunlop GT 600 performance tires, and its flexible front-strut tower bar and flexible front and rear draw stiffeners. STI’s rear flexible draw stiffener fitted to the S209 show car at the Detroit Auto Show in January 2019. STI is only capable of building five cars a day when at maximum capacity. Takatsu said that with S209 production, they can pump out just two cars a day. For comparison, Subaru’s Gunma assembly plant, the factory where the normal WRX STI is built, is capable of building more than 900 cars a day, according to Launch Control in 2015. The plant can fully churn out an STI in 20 hours. If you’re interested in how more normal Subaru and STI production in Japan happens, check out this Launch Control video and skip to around the 10:40 mark. Where that video doesn’t go is Kiryu-Kougyo, showing how much slower and more specialty that line is. 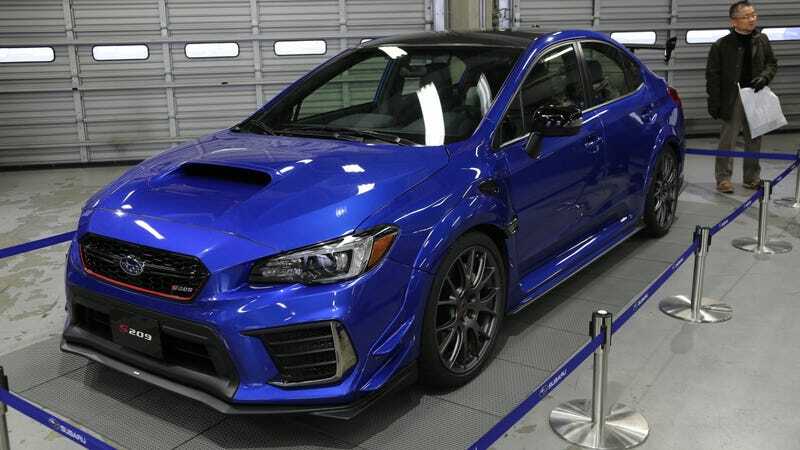 Masuo Takatsu, STI’s general manager of product planning and development and the project manager for the current-generation WRX and WRX STI before jumping from Subaru to STI, also explained that though this is the current procedure for S-line cars, it might not be that way forever.